More than ever sportsbikes are inching towards being ultra-focussed track weapons with ever-shrinking dimensions, excessive power and knife-edge handling. But with its simple, modestly-powered V-twin engine, all wrapped up in a sweet-handling chassis Ducati’s new SuperSport has more than enough power for the road and will dance through your favourite corners with ease. It isn’t sports tourer-comfy, but it’s practical enough for commuting and long trips away. A genuine every day sportsbike. Without an excess of power to worry about you can concentrate on ringing the most out of the Ducati’s relatively heavy, but rock solid stable Monster-based chassis and well-set, fully adjustable Marzocchi forks and Sachs rear shock (adjustable for preload and rebound). Steering is effortless and things never get out of shape, no matter how hard you push, how low you lean, or how bumpy the roads are. Ducati claims the SuperSport will keel to 48 degrees before metal scrapes tarmac. The ride is plush, controlled and the standard Pirelli Diablo Rosso III tyres give immense road grip. They’re especially impressive in the wet. The SuperSport has the poise through the corners to keep up with a race replica on the road and the ABS-assisted M4.32 Brembo monobloc radial calipers give Ducati superbike-levels of fadeless power and feel. You also get the added security of traction control, but the power modes are a bit pointless. 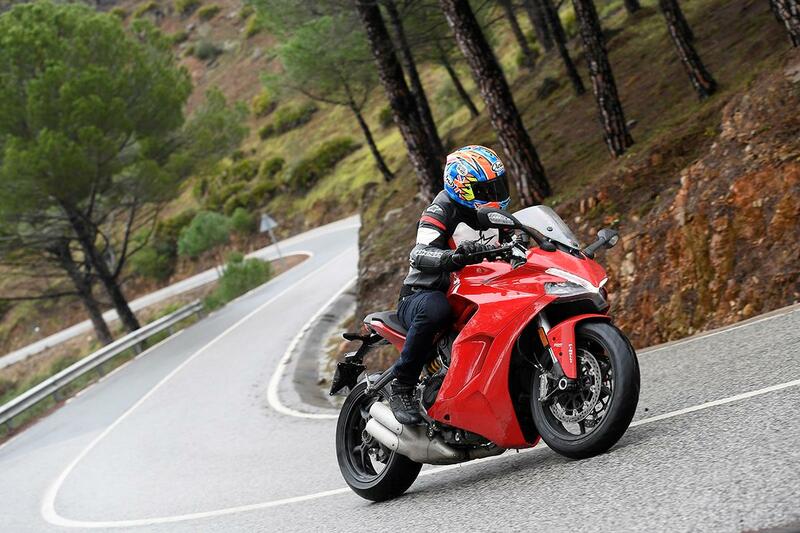 Urban and Touring modes make the Ducati feel like you’re riding with the brakes stuck on. Sport is the only mode to select for instant, free-revving acceleration. One thing the SuperSport isn’t is a tourer. Yes, your magnetic tank bag will snap nicely to the 16-litre steel fuel tank and the tall, thin screen is two-way manually adjustable, but the riding position is sporty, even if it doesn't fold you in half and inside out like a tortuous race replica. The SuperSport has a bum-friendly seat and relatively generous legroom, but taller riders will still need to bend their legs a long way to get their toes on the footpegs. And while the handlebars are mounted high on risers it’s still a fair stretch to reach them, forcing you to ride with straight arms, so things get a bit ‘wristy’ on long jaunts. Compared to a conventional sportsbike you’ll cover longer distances with less stress, but the SuperSport isn’t the last word in comfort that some may have hoped for. The 113bhp liquid-cooled 937cc V-twin is a retuned Hypermotard 939/Multistrada 950 unit. Despite its modest power the big V-twin motor is tuned for sporty riding with a revised crankcase and cylinder heads. The ride-by-wire throttle is friendly, but the reworked engine doesn’t have that instant, explosive, wheelie-inducing thrust you get with the unhinged, foaming-at-the-mouth Hypermotard 939. Instead the engine is tuned for a longer spread of power. There isn’t a whole lot of grunt at low rpm, so you have to work the motor hard for best results. The more you rev it, the deeper and harder-edged the engine note becomes and the quicker the scenery blurs around you. For everyday riding the engine is flexible and can be ridden at lazy revs in high gears, but you’ll need a flurry of left foot activity and a big handful of throttle to make fast getaways. Of course, there’s more than enough power for the road, but experienced sportsbike riders will want for more and it does lack a certain fun-factor. But like the old 90s and early noughties Ducati Supersport, your speed comes less from ‘point-and-squirt’ and more from maintaining momentum and carving perfect, high-speed arcs through fast corners. It’s here where the new SuperSport excels. Build quality is superb and there are lots of nice Ducati detailing touches, like the milled ali top yoke and a repeat of the bike’s ‘face’ on the plastics surrounding the dash. When you look at what an actual supersport machine costs the Ducati SuperSport starts to look reasonably priced. The new R6 is just a few hundred quid cheaper and there are some cracking PCP deals out there, too. Service intervals are every 9000-miles for an oil change and general check and 18,000-miles for valve clearances, or every year, which ever comes first. The base SuperSport comes with a high level of chassis and electronics spec, but there’s also an S model. It has the same motor, chassis, electronics and Brembo brakes, but comes with fully-adjustable Ohlins forks and shock, a seat cowl and a quickshifter/autoblipper, which you can also fit as an accessory to the standard machine. The Ohlins and electronic shifter adds an extra layer of control and sophistication. It offers a plusher, more controlled ride, gear changes are snappier and you never have to use the clutch, other than when pulling away and stopping. With their easy power, safe electronics, supple chassis and generous ground clearance, both the standard and S models will make superb trackday bikes for less experienced riders. As you’d expect there are lots of official accessories available including a Sport Pack, including carbon and billet ali trinkets and flip-up levers. The Urban Pack comes with a tank bag, alarm, rubber footpeg inserts and you get a taller screen, heated grips and panniers with Touring Pack. SuperSport S, featuring Ohlins suspension, autoblipper/quickshifter and seat cowl. 5 owners have reviewed their DUCATI SUPERSPORT (2017-on) and rated it in a number of areas. Read what they have to say and what they like and dislike about the bike below. I just love this bike. It wants to gallop but isn't scary. Been on some back country irregular road surfaces and it'll take care of you while running near 100%. It's comfortable enough for all day riding and is fun, fun, fun. I test rode the bike based on online reviews and it does what the reviews say - a sporty bike without the pain or fear. The mirrors aren't great, you can see something is there but mostly not what it is. In other words, a great road bike. Is there a sexier looking thing to roll up on? I've run 2-3 hours, arrived at my destination and not wanted to stop. There are never any doubts about braking and I love the ride. It copes with rough or smooth New Zealand roads really well, while holding onto or running quicker than others I ride with. I love the power delivery of this bike, it feels like it's got rubber pistons and just makes me laugh (in a good way). I love the poppety-pop on deceleration. The fat mid-range is just swell. Although I thought it was rattly at first, that's two cylinder, desmodromic character for you. Quote addictive. So far I've had no problems. It hasn't broken down and is showing no signs of deterioration. There's better dash displays now, but functionally everything is there. I absolutely love the quickshifter, although you do have to be definite and firm to ensure no false neutrals e.g. between 4-5, 5-6. I replaced the tyres with EOM and I'm happy with that. It makes you smile no matter what. I'm a returning rider, coming back after 25 years. The SSS is a tad lighter than my old bikes, with similar peak power and torque, although the power spread is way wider than what we used to have. It ticked the boxes for looks. It rides absolutely beautifully. It is everything I ever wanted in a motorcycle. My wife, who also rides (and has had a similar layoff), came back after one of her first rides with a huge grin on her face and said she suddenly understands what sports oriented bikes are all about. I did a returning/intermediate riders course. The young blokes on their gixxers and R6s could not believe how quickly it could stop. The Brembo brakes are amazing, so much feel. The Ohlins suspension is sublime. It handles so well, but I haven't had to find the old kidney belt I used to wear on my Katana. If there is one area that has improved out of sight over 25 years it is the handling and brakes. I thought I would struggle to get used to a V twin after inline fours. Huh. Broad power, lovely sound, so much character. I'm a convert. Cheap to run (5.2 L/100km over 4500 kms). Tyres still have tread. Claimed service cost (700AUD over 2 years) seems reasonable. The S with its quickshifter (as well as its standard electronics) is pretty well equipped, but it could use cruise control. But what's with the indicators? My XJ750 from '84 had self cancelling indicators. Why hasn't the Duke? Bought from the sole Ducati dealer in South Australia but the service was exemplary. Well done Mike and team! The best real world Ducati? A fantastic mix of full fat Panigale and Monster dynamics. This is a special bike. I ran a 2013 Multistrada with the skyhook suspension and the Supersport S beats it. Still running in but the demonstrator I rode was very good. The chassis could take another dose of power but it is not slow! The 959 may have another 45 bhp but it is no faster in the real world. Early days and other than traditional tight Ducati gearbox (bit of a sod to find neutral) faultless. Servicing is not stupid money but you need to factor in all the other costs (tyres, road tax etc) to know what you are letting yourself in for. The quick shifter/auto blipper is amazing! Give it the beans and tap up as you get close to the Rev limit for full effect. No fluffed gear changes. It’s a Ducati! You will be proper looked after at a main dealer. Who'd buy a bike in January?! Having spent the last 4 years putting 32k miles on an 1100 monster I thought the supersport, with its monster frame and smaller engine wouldn't hold any surprises. I was so very wrong. This bike is very special; plush and sophisticated, with all the agility of the monster but with a much smoother and stronger power delivery. Ride is immense, brakes sensational but I do have a few niggles. Firstly, the clutch can be terribly snatchy on those cold February mornings for the first 5 mins or so. So snatchy that you need to be committed and pointing in a straight line to avoid a potential drop. Secondly (and lastly) the mirrors; they're not terrible but they really only let you know there's something behind you not what. The whole design package is flawless. Beautifully executed, as your expect from the chaps in Bologna. Value? Well, I bought an ex demo from my local dealer with a couple of nice accessories for 7k GBP and a trade in. In today's market I don't think that's so bad. This bike is the standard model with a few accessories which include the DQS, seat cowl and heated grips. DQS is a nice option but not essential, seat cowl is purely for aesthetics and the heated grips are a Godsend. I have owned all manner of race bikes, I have also done over 100 track days and recently took this to Silverstone, Not its natural hunting ground, but this bike was awesome once the geometry was altered. Apart from the 180 mph track speed and clip ons this bike is a beautiful bike, easy to ride and get it on the road and it keeps up with a panagale no problem. Just be braver of those fantastic brakes.